I've got to say something about this since it's not only annoying but also slightly amusing considering the nature of the material in question. As you may or may not know, I have a YouTube account where I post Public Domain horror movies. That's all I have on there. I don't have any original content of my own, there are no adverts, and nothing is monetised. Basically, the movies are just a little gift for my blog readers. I've never been allowed AdSense advertising anyway due to the nature of my blog. It seems that they don't like horror sites and class them as "adult content". I would have thought that would be a good thing since adults are the ones with the credit cards and Paypal accounts after all, but there's no accounting for taste or common sense. Anyway, here's this week's story for you. Yet again, another company is trying to make money out of something which they are not entitled to and are attempting to use one of my uploads to do it. Here's the latest claim which I have disputed. It's ironic that they've chosen the video that I've had least hits on. To date, I've had only 46 views of "Night of the Living Dead" which isn't too surprising when you realise just how many thousands of accounts already have "Night of the Living Dead" posted on them. According to the YouTube search, it's "About 35,700 results". Night of the Living Dead entered the public domain because the original theatrical distributor, the Walter Reade Organization, neglected to place a copyright indication on the prints. In 1968, United States copyright law required a proper notice for a work to maintain a copyright. Image Ten displayed such a notice on the title frames of the film beneath the original title, Night of the Flesh Eaters. The distributor removed the statement when it changed the title. A limited number of theatrical release prints were distributed by Walter Reade and these copies could have been shelved if Romero and Image Ten had elected. This would have given Romero the opportunity to rename the film, do a few brief "creative" edits, and then obtain a new Copyright. But this was never done and the theatrical releases continued to be distributed until eventually reprinted and distributed by home video distributors. Because of the public domain status, the film is sold on home video by many distributors. 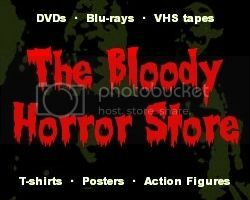 As of 2012, the Amazon.com lists copies of Night of the Living Dead retailing 51 on VHS, 168 on DVD, and six on Blu-ray. The original film is available to view or download free on Internet sites, such as Google Video, Internet Archive, Hulu, and YouTube. As of July 28, 2012, it is the Internet Archive's second most downloaded film, with 1,003,011 downloads. 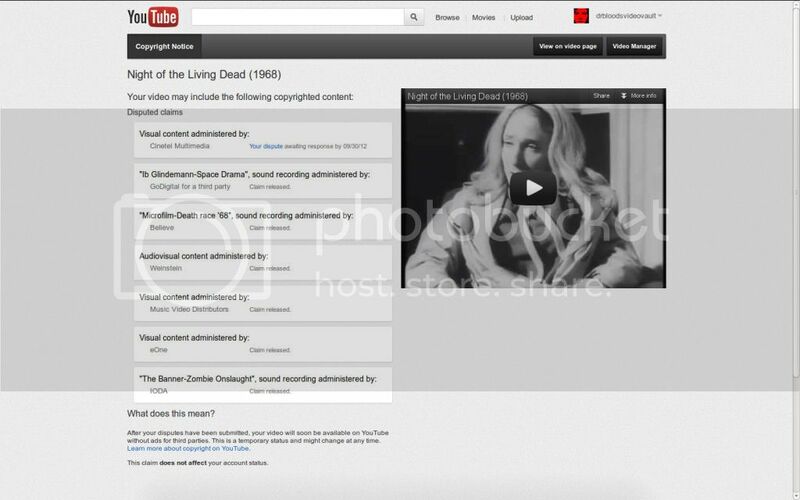 Of course, in each and every case where some bogus claim has been filed against me for reposting "Night of the Living Dead", I have entered the information above in the dispute box and the claim has been released. Quite right too because if George A. Romero can't make any money from his own film, why should anyone else? There seem to be a lot of these fraudulent claims happening on YouTube. I don't know if it's some kind kind of automated system or just individual companies, who I've honestly never even heard of before, tracking down what they perceive to be easy and gullible targets to steal a quick buck. I'm sure my 46 video views will be worth millions to them. Idiots. The really annoying thing about this whole situation is that it takes a month to resolve each case, if the "third party" actually responds, and, in that time, YouTube allows them to have advertising next to the disputed video. I can't have AdSense on these videos, nor would I even if I could, yet these fraudulent claimants can use my account to advertise? What the bloody hell? Suffice it to say that this is yet another reason why fewer people are using YouTube now except to blatantly upload copyright infringing material rather than staying within the "Terms of Service" or adhering to the letter of the law. Why should the average YouTuber even try to keep their account clean when some monstrous corporation can come along, make a fraudulent claim, and reap the rewards from it? Since Google have linked YouTube and Blogger, every day I expect to see my both my accounts deleted even though I've done nothing wrong. With the amount of original content I've provided on my blog, AdSense should have been falling over themselves to slap their annoying adverts everywhere, but why would they bother when their system can already give more money to frauds, liars and thieves who don't need it in the first place? That's my rant over. Have a nice day!